Fence Cleaning in Ipswich, QLD 4305. Aclean House Washing are qualified and experienced Fence cleaning specialists in Ipswich. We specialise in all aspects of fencing cleaning, Vinyl Fence Cleaning, Deck Cleaning service in Ipswich. We provide high-quality cleaning services at best price. Don’t you want your Ipswich home to look complete and neat? Not just from the inside but on the outside as well? To a great extent, you will get a round of house cleaning, done, then maybe pressure cleaning and building exterior cleaning done in Ipswich. But still it feels incomplete and your house is not looking clean complete? What could that missing element really be? The missing element is fence washing. It is good to engage cleaners from say A Clean House Washing to take care of the fence washing. Once a fence washing is done in your Ipswich home, you can notice the difference for yourself. The building exterior and the fencing will be all clean and your house wears a very pretty look. All thanks of course to the cleaners from the experienced cleaning services company- A Clean House Washing. So, in order to augment the look of your home or property in Ipswich, exterior cleaning, pressure washing or ensuring that your home is clean will not just suffice. The fencing too should see a round of periodic cleaning and washing so as to give it a complete, clean look. And not just this, the fencing too can see dirt build-up and mould growth. So if a round of pressure washing or fencing cleaning is employed then the fencing looks all neat and nice. So along with a house washing, fence washing too can be carried out. 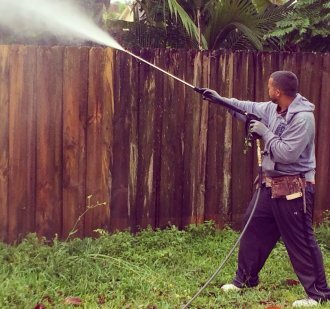 If you want to engage any fence washing service or any other cleaning services we offer, then just connect with A Clean House Washing on 0419 778 863. Or email us on acleanhousewashing@gmail.com.